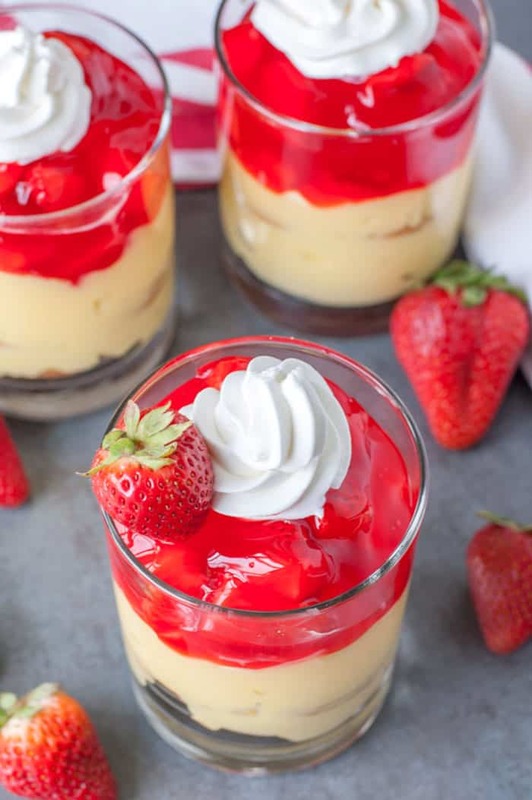 Simple and classic, this strawberry parfait dessert is one everyone will love. Hi everyone! Heather here from Food Lovin’ Family sharing one of my favorite EASY summer desserts. Sometimes simple is better. I am sure you have heard the saying KISS, keep it simple sweetheart. 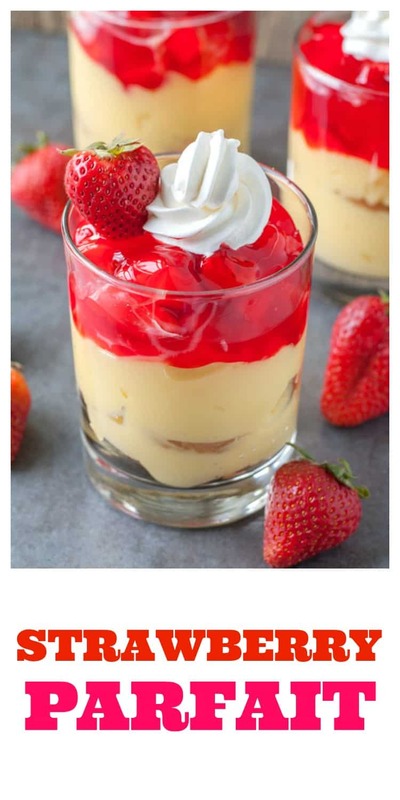 🙂 That is what I love about these fresh strawberry parfaits. With a few ingredients, you have a delicious dessert. Berry season is here, in fact my daughter’s class just went to pick strawberries for a field trip at school. She brought home a big basket of fresh, beautiful strawberries for us to eat. I will admit we ate most of them straight out of the basket but with the few we had left, I decided to make these strawberry parfaits. To make these pudding parfaits, mix together one box of instant vanilla pudding with milk and chill until it sets. Chocolate pudding would be great too! 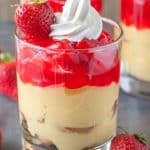 Layer vanilla wafer cookies, pudding, more cookies, more pudding and then top with a mixture of fresh cut strawberries and strawberry glaze. Strawberry glaze can usually be found in the produce section. Top the dessert with a dollop of frozen whipped topping or whipped cream. For these parfaits I typically serve them in small glasses. You could also use a small trifle bowl or an 8×8 baking dish. Some of my other favorite summer desserts are this Yum Yum Pie, great for the 4th of July holiday, Robert Redford dessert, and always classic Banana Pudding. Thank you for letting me share with you today. Be sure to stop by and say hi at Food Lovin’ Family. Mix together one box of instant vanilla pudding with milk and chill until it sets. 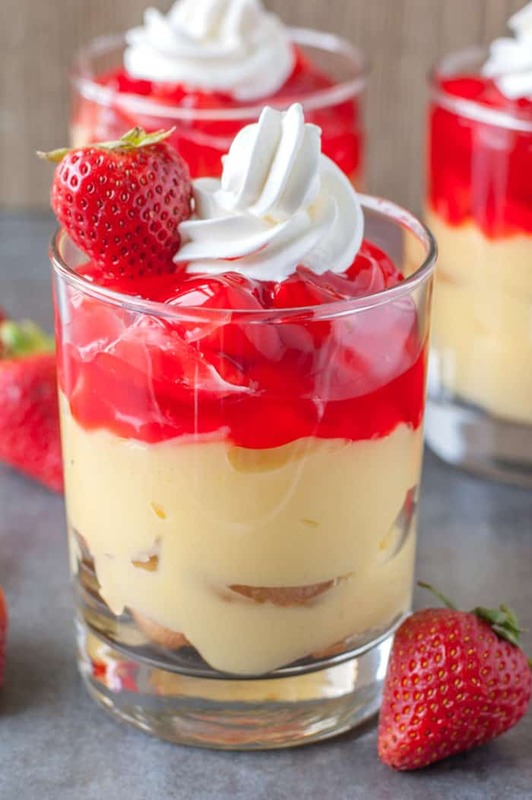 Layer vanilla wafer cookies, pudding, more cookies, more pudding and then top with a mixture of fresh cut strawberries and strawberry glaze. Top the dessert with a dollop of frozen whipped topping or whipped cream. These look delicious. I’m going to make them with the chocolate pudding. The whole family will love them with the chocolate flavor with strawberries. Thanks for sharing.